Here we are in full fledged Spring in Southwestern Ontario, Canada. It's a time for change and we have some of our own changes to announce. The Healthy Neighbour Project has been adopted by The Bruce Botanical Food Gardens. This Garden project is scheduled for phase one construction in June...next month! The BBFG (as we like to call it) is going to have a focus on heirloom varieties of fruits and vegetables, herbs and edible flowers. 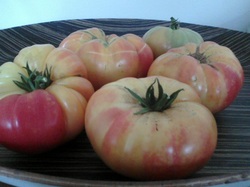 From one online heirloom catalogue alone, there are some 73 varieties of heirloom tomatoes that you too could be growing. Red, Orange, Yellow, striped, pink, macro, micro, round, bellshaped...................the list goes on and on. 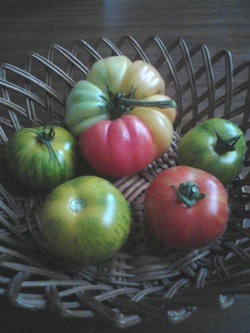 Do an online search for 'Heirloom Tomato Seeds (and enter your location here)" and we're fairly confident you'll be surprised at what you will find. Are you a composter? Do you save your coffee grounds, egg shells and other scraps? Do you prepare and eat your own fish? Here's a tip we've seen recently. Dig the hole for your tomato plant to about 8-10" deep. Put a spoonful of coffee grounds or tea leaves into the hole. Add a few crushed up egg shells and.........are you ready?............the throw-aways from your fish-the head, carcus, tail etc. Give it a bit of a stir. Add an inch or two of soil, remove a few of the lower leaves of your tomato plant, set it into the soil so that the stem where the leaves were removed are below the top soil line. Backfill with soil and press down with your hands, making a small depression around the base of the plant. Water thoroughly and be ready for some pretty spectacular growth! Hastings & Prince Edward Counties Health Unit Harvests a Bounty! I don't live close to most of you but I do live close to the GC Huston group and have had the great pleasure to watch the vast number of plants grow over the season. Plots that weren't taken upin 'Our Community Garden' by gardeners were planted by the coordinator with tomatoes and zucchini for the most part. And grow they did! I'll try to post some photos here in the coming days. The most rewarding day in the garden for me was one when a young man approached me and asked about how the garden worked. He wondered if 'Our Community Garden' meant that anyone could pick the veggies. I explained that the plots were rented for a 'dirt cheap' fee for use over the season. I sent him away with arms full of tomatoes, zucchini, lettuce, spinach, basil and swiss chard. The smiles were worth a million. He's going to be back next season for his own plot. This is the true story behind The Healthy Neighbour Project. Yes, tomatoes are the goal but the social wellbeing and growth of the participants is a very healthy biproduct which will enrich the lives and relationships built within your community. Thank you Jason for dropping by and being open enough to ask about the garden. You got the smiles but I made my day! Well, it's been about a short 12 days since my last post when flowers were starting to form on my tomato plants (started from seed) and already I've been starting to pop those 'oh so sweet' yellow grape tomatoes! Only a handful at this point but the loaded stems of flowers promise a long lasting taste sensation. Weather here in Western Ontario Canada has been excessively dry and hot. In Wingham Ontario last week, a temperature monitor at a school I was visiting read 39 deg C....I can't ever remember a day that hot. And at 31 today, it is promising a humidex of 48 deg C by the end of the week. Although tomatoes like to dry out a bit and don't like wet feet, don't forget to water them during the drought. After all, that luscious watery juice inside needs to come from somewhere! Hope your project is starting to take shape. Don't forget to start weighing your harvest! Well, the warm season is here (at least in Ontario Canada) and tomato flowers are flourishing, tomatoes are forming and my mouth is ready to pop one of those luscious red fruits any time now! How are your tomatoes coming? If you read below about the comfrey, I chose to put the comfrey leaves around my plants. They seem to be flowering much better now and the leaves have decayed enough to be just brown atop the soil. So, as they ripen, please don't forget to weigh them. If you are reading this blog and haven't signed on to The Healthy Neighbour Project, feel free to sign up now or whenever! If you'd simply like to share your tomato growing stories, we'd love to share them here as well. I'm about a week away from actually weighing anything but I do hope to report something to start with soon. Send your photos along with your name (first is fine) and your location and we'll share your success with ....well, THE WORLD! Tired of payng for fertilizers for your tomatoes and other garden plants? Grow your own. Comfrey is a gardener's gold. Every gardener should have one. Although some comfrey varieties are classed as invasive, Bocking 14 (Russian Comfrey) produces non-fertile, flowers and unviable seeds so growth is controlled. This is, nevertheless, a large prolific grower and has an extremely heavy growth so it must go in a place where it has room to grow-best away from other plants that it can choke out . The plant has an extremely long tap root-many feet deep in most cases. That tap root draws potassium from deep down in the soil, a source that is otherwise unavailable to gardeners. The potassium and nitrogen are stored in the leaves and, when laid on soil, quickly decompose releasing the key fertilizers into the soil for uptake by your plants. You can use leaves straight from the plant. Lay them around your tomato plants and perhaps weigh down with grass clippings or a bit of soil just so they don't blow away. If you are planting tomatoes in a pot, lay the comfrey leaves in the bottom of the pot and plant the tomatoes over them. As they decompose, the nutrients will be released to the roots. Feed occasionally with fresh leaves on top of the soil. You can also reserve a liquid from rotting leaves but it is much more time intensive to do so and the liquid version can cause problems if not applied properly. It is also reported to smell....pretty bad! So, if you don't have a comfrey plant in your garden, reserve a corner for one or find a friend who will. Make sure you are happy with the location because once planted, you likely won't be able to get rid of it.....but then You won't regret it. I was in to the GC Huston Public School in Southampton Ontario the other day and saw the GC Hawks progress on their class Healthy Neighbour Project group....WOW! we have some awesome gardeners coming up behind us! Their plants were about 12" high and extremely robust. And this group has quite the community project going on outside their school. Community players have come together to build over 30 garden plots-some are small 4 x 10 foot plots while others are 10 x 10 foot monsters. The comraderie that occurs in that garden is something to behold. The garden paths have just been spread with shavings donated by tree removers. The students have pizza days throughout the year and have saved all of the boxes. They've laid them down on the pathways and topped up wtih the shavings...gotta love the reuse concept there. A local dome home builder has created a great wood storage shed with a slanted roof that will eventually fill a water barrel and a great cedar bench awaits a weary kneed gardener. Complete with picnic table and identirier sticks, this is a place for community to come together. This site will eventually be home to a dome teaching room outside abutting the community garden. The vision is spectacular and it just seems to have taken on a life of its own....not with out the beaded brows of some very dedicated individuals though. Music and shared foods are planned later in the season and you have to know Southampton. Besides being a gorgeous little town with a strong arts community, they are also blessed with the Saugeen River, miles of Lake Huron Shoreline and spectacular award winning sunsets....and a community full of people that appreciate each other. Way to go GC Huston! We'll be waiting for your weigh ins! For those of you who have planted your tomato seeds inside and are hoping to put them into the ground to grow outside, you must "harden off" the plant first. This can be done by taking the plant outside for short periods of time gradually increasing the time each day. I start my plants with one hour in a shaded or protected area for the first day and gradually increase by 30 minutes each day until they are totally acclimatized. Then you are clear to plant them outside. Be sure that when you plan to plant, all fear of frost is over OR you are willing to cover your plants with plastic to protect them overnight. If you do cover them, make sure that the leaves don't touch the plastic on the inside and be sure to raise the plastic off of them in the daytime. Tomatoes love the heat and the air. They grow well against a wall where the heat rebounds but they also like the breeze to move through them so be careful where you site them. Unlike many food crops, tomatoes can be planted in the same space each year. Planting companion plants with them is also a good cross check for pests and disease. Chives, or basil, or lettuce work really well with tomatoes. Basil planted close by has been reported to deliver a tomato with a slight hint of basil flavour so that's an added bonus! 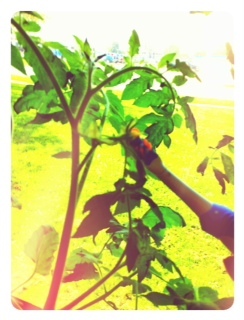 Tomatoes can dry out a bit between plantings but don't let them wilt...they need moisture to produce the best fruit. Soil should be well drained. Make sure that you plan to stake your tomatoes. Many varieties grow naturally on the ground but this takes alot of space and slugs and other bugs can easily infest them on the ground. Staking your plant will help produce nice round, perfect fruit that is much easier and cleaner to harvest. The fruits will be heavy so make sure your stake is of appropriate size to support your prize! Here at The Healthy Neighbour Project we would LOVE to have your report and photos of your successes or your problems. Please feel free to contact us....see the Contact Page. What do the Aztecs, Nelson Mandela, the giant tortoises of the Galapagos, Bunol Spain, A West Virginian Auto Mechanic, Romanian dictator Nicolae Ceausescu, a German legend, the National Gardening Association, and the US Supreme Court have in common?